Panthers have been unable to scheduled their final Premier Leahue fixture in Edinburgh. 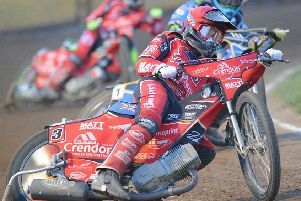 Peterborough Panthers promoter Ged Rathbone has called the conclusion to the Premier League season ‘highly unsatisfactory’. Panthers face missing out on a play-off spot due to not being able to complete their final meeting ahead of the September 19 cut-off date. Panthers currently sit one place and two points outside the top six with an away clash at Edinburgh, which was originally postponed back in August, still to be arranged. But Rathbone has given up hope of that happening ahead of Monday after failing to agree a date with Monarchs bosses. And he revealed his attempts to secure an extension to the cut-off date - to allow such an important meeting to take place - have been ignored by the sport’s governing body. Rathbone said: “We find ourselves in a highly unsatisfactory situation and to be perfectly honest the whole season has been pointless. “How can it possibly be right that we miss out on the play-offs due to riding in one fewer meeting than our rivals – and through no fault of our own? “And can you imagine that happening in another sport? Of course not . . .
“I’m not for one minute claiming that we are guaranteed to win at Edinburgh, but we should have the opportunity to try to do that. “The only date Edinburgh offered us initially was tomorrow (Friday) – a day when we had already said we could not race due to having four riders involved in international events and not being eligible for facilities for them. “Edinburgh failed to offer us three dates as the rules state they should, and it is only in recent days that they have now given us the date of September 23. And Rathbone insists the financial losses he has incurred by ensuring all Peterborough home meetings were completed ahead of the play-offs make the situation doubly disappointing. “We had to schedule a double-header to make sure we got our fixtures completed,” added Rathbone. “And when that was postponed, we re-arranged them for last Friday and Monday. “We’ve been hit in the pocket in the process, but we felt we had to do it due to the importance of the fixtures and for the integrity of the sport. “But I’m starting to wish I hadn’t bothered and I will still end up with a wage-bill running into thousands of pounds when we have to go to Edinburgh. “The cut-off date was originally September 12 and we would have qualified comfortably at that point. “It has then been extended to September 19 to suit other clubs to and we now find ourselves out of the top six. “We do only have ourselves to blame for being in this position after being in such poor form in the last few weeks, but it is a very disappointing and very unfair situation.